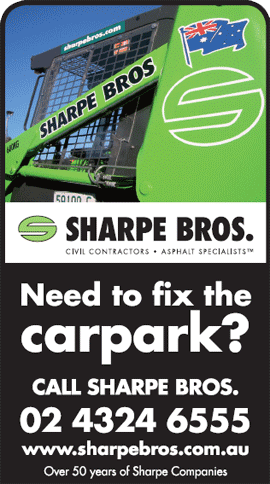 As one of Australia's leading road companies, Sharpe Bros has a strong sense of purpose. As multi-award winners and with robust management systems, Sharpe Bros combines traditional quality practices and extensive experience with a take charge, roll up your sleeves attitude. Our expert services are available throughout New South Wales from the Sydney area, through the Central Coast to Newcastle. Contact us for more information to see if we can provide your location with our professional contracting services. We offer a full range of environmentally sound solutions for all stages of the road pavement lifecycle: new asphalt pavement surfacing, road edge repair, road stabilising, heavy patching of road pavements, utility reinstatement and restorations, road open drainage maintenance, car parks, mining haul roads, recycling, rehabilitation and construction. No other firm offers the spectrum of services that we do. In a fragmented industry where firms will specialise in one or two processes, Sharpe Bros has become an integrated provider with experience and know how across the regions. Fast and cost-effective road edge repair technology from trusted civil contracting firm, Sharpe Bros® Sidewinder® technology can pave road base, gravel, recycled materials or asphalt resulting in wider, stronger and safer roads. With hydraulic grade and slope control, multiple layers can be paved from 200mm below grade to 200mm above grade. The Federal Office of Road Safety has found that when traffic lanes are widened by just one metre, the rate of head-on and run-off road crashes can fall by 20 percent. With massive investment in Research and Development, the Sharpe Brothers have substantiated their intention to maintain and build on a heritage of innovation. A formidable accumulation of experience. Sharpe Bros have a long history of providing our customers the benefits of innovative, world class infrastructure services. Utilising time tested knowledge and with our hands-on experience, we partner with our customers to provide innovative project delivery methods and construction management for long term road maintenance improvements. The demands on road budgets are growing and the motivation for all project team members to increase efficiency has never been greater. Sharpe Bros took up the daunting challenge of designing and producing worlds best technology for road recycling and maintenance. The development of the Rotamixer technology helps to consolidate a series of technologies that have been put through gruelling tests and produce extraordinary results. Sharpe Bros engineering capabilities along with extensive research and development, on the job trials, tests and studies, place the company in a unique position to provide outstanding value for money and longer lasting roads. Rotamixer embraces the highest standard of modern technology, while remaining true to the Sharpe Brothers ambitions, carrying the traditions of innovation and engineering forward. The unique and highly efficient Adjustable Patching™ process, developed by trusted civil contracting firm, Sharpe Bros®, allows you to pave only what you need to pave - saving time, materials and maintenance costs. The full sized high performance Flexipavers® from Sharpe Bros® can pave roads and intersections at full width and are also suitable for patching and repair works at narrow widths down to 600mm. The Sharpe Bros® system is height-adjustable so that all new work matches the surrounding pavement with no dips or bumps, while the machine finish, with less hand work and less guess work, results in smoother road surfaces. The same technical expertise and competitive pricing that fits well with local governments can be the perfect fit for your own paving needs — whether you need to repair the car park, fix the haul road, maintain the factory yard or simply improve the road to the winery, look to Sharpe Bros. to get the job done. "Customers are our focus." Our people have built a culture of honesty, integrity and safety with a target to exceed customer expectations every day. Sharpe Bros. consistently bring open-minded ingenuity, innovation and time-tested knowledge to every project. The Sharpe Bros. crews are highly trained and are equipped with the latest tools and equipment to provide superior strength and finishes to all asphalt paving works. The Sharpe Bros. Art Prize is part of the annual Gosford Art Prize, which is held at the Gosford Regional Gallery. The Sharpe Bros. is an acquisitive award for photography by Australian artists, sponsored by Sharpe Bros. (Aust.) Pty Ltd.
As part of the annual Gosford Art Prize, The Sharpe Bros. Roadworkers Prize is judged and awarded by 10 selected workers of Sharpe Bros. (Aust.) Pty Ltd. The Prize was initiated as part of the Company's values of providing and maintaining an environment for people to work and grow. The Sharpe Bros. Emerging Artists Prize is part of "Emerging", a biannual prize which showcases the talents of young, emerging artists from across the State of New South Wales. Sharpe Bros. (Aust.) Pty Ltd sponsors The Sharpe Bros Emerging Artists Prize, an acquisitive award, and also provides funding to the Gosford Regional Gallery to allow a special focus on providing new Australian artists with greater opportunities for career development and exposure of their work. As a leading Australian company, Sharpe Bros is dedicated to a safe working environment. We provide this through training, instilling and reinforcing safe behaviours. A lot of companies have great safety programs. Sharpe Bros has created a safety culture - More than a program. Safety Bro® is the Multi Award Winning workplace Mascot for Health, Safety and Environment. The Safety Bro® Program is an addition to OHS&E systems and procedures. Safety Bro® is a fun character with a bold and in-your-face way of promoting work place safety. Safety Bro® is featured on the cover of all safety induction handbooks, daily work sheets, coffee mugs, message boards, work stations, in the lunch room in the board room and as a sticker on all plant, equipment and vehicles. Sharpe Bros. has developed a series of case studies that show the results that can be achieved with the Sidewinder and Flexipaver technologies. Working with Australian Local Government Councils and State Road Authorities, these case studies demonstrate our technology and the benefits, along with testimonials from some of our customers. We fix roads. We build and maintain car parks. We construct pavements for industrial and commercial sites. We are civil contractors and asphalt specialists. Sharpe Bros is capable of all types of road maintenance projects ranging from minor repairs to major rehabilitation. With decades of experience and proven technologies Sharpe Bros is a leader in the roads industry. At Sharpe Bros. we have extensive experience with construction and maintenance of all types of sports and playing surfaces. We have completed works for schools, universities, sporting clubs, council sporting facilities and more.